We have been so incredibly lucky with our hosts, but not with the weather. We have been cycling in torrential, nonstop rain for the past two days, yet we’ve been welcomed with open doors, tasty meals and comfy sleeping arrangements. Our Warm Showers hosts for the first night cooked us dinner, which we ate by candle-light (for mood enhancement and energy conservation). They were very interested to talk about our project. We ended up talking for hours. Daniel (far left) is studying geography and economics, and renting a room in Gary’s house. 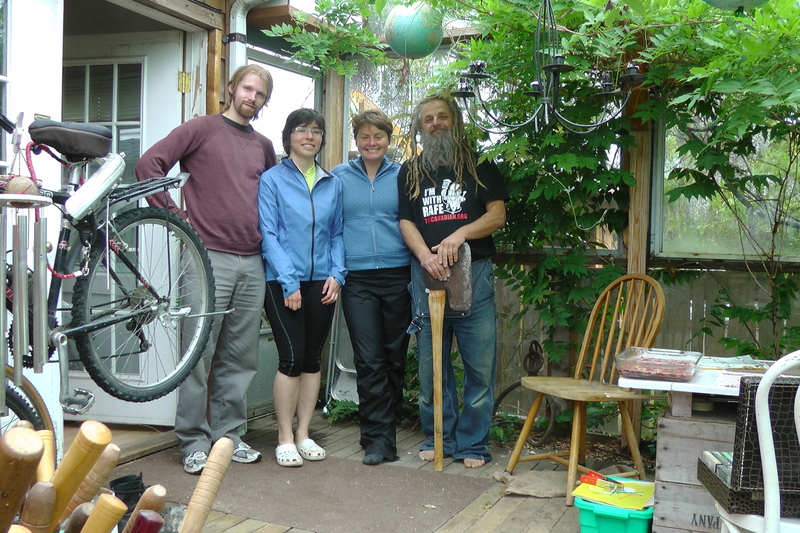 Gary (far right) is a carpenter, an engaging storyteller, and an amazing cook. Don’t be fooled by the enormous axe, he’s a really nice guy. One of the first things that came up in our conversation is the issue of salmon habitat conservation. Both Gary and Daniel advocate for preservation of salmon habitat. Gary’s philosophy is that if there are regulations that you believe aren’t right, it’s important to stir up the sh*t, even if the results are not immediately visible.